I absolutely love pumpkin. There is something so comforting and relaxing about baking and cooking with winter squash, especially pumpkin. While I make pumpkin dishes year round I make a large number of pumpkin recipes during the fall and winter. The cooler months seem to just cry out for pumpkin. Everyone always thinks of pumpkin bread and pumpkin pie, but I love savory dishes that utilize the squash. As I have stated before my family loves pasta. Growing up my mother made pasta multiple times a week and it has been an ingredient that I have loved ever since. My two boys are huge pasta eaters and will eat spaghetti tossed with olive oil as a snack. Combining pasta and pumpkin is something I love to do. A couple of weeks back I tried a new recipe for Baked Ziti with Pumpkin and Sausage from Libby's Pumpkin. This recipe has 12 ingredients. It takes 45 minutes of total time, 20 minutes of which is active and makes 12 servings. I had no problems finding any of the ingredients at my local grocery store and I made no ingredient modifications. Since I eat gluten free I used gluten free penne and gluten free all-purpose flour. I am not a huge fan of reduced fat mozzarella and always buy fresh mozzarella so I used full fat fresh mozzarella instead of the shredded suggest by the recipe. I prefer fresh mozzarella, the taste is superior to shredded. I found that it was hard to have enough pasta to spread across the pan when layering. Don't worry though once it is baked it works fine. I actually added the mozzarella cheese at the beginning of the cooking time and then the Parmesan cheese the last five minutes. I preferred this method since it allowed the fresh mozzarella to fully melt. If you like your pasta with a kick I would suggest adding more cayenne. I only added a pinch as suggested and I felt that it needed a little more flavor. I would add 1/8 of a teaspoon of cayenne or 1/2 teaspoon of crushed red pepper if you like spicy foods. My husband was pleased that the recipe made the gluten free pasta not noticeable. He eats gluten free at dinner with me, but gluten free pasta he often finds lack luster. This dish was nice since it masked the taste of the gluten free pasta and the flavor from the pumpkin came out nicely. For the recipe go to Baked Ziti with Pumpkin and Sausage. Have you ever tried pumpkin and black bean enchiladas? They are amazing! thank you for your valuable appreciation and thoughts on my parenting blog http://perspectiveofdeepti.blogspot.in/, looking forward to more interaction!! No problem :) Come back again soon! 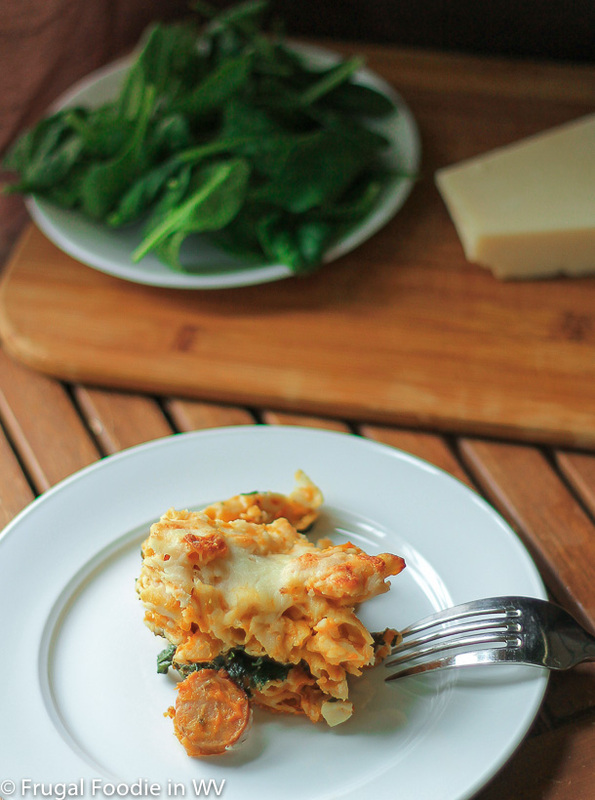 Two of my favorite things - baked ziti and pumpkin! This is so me. Pumpkin in baked ziti? YUM. I so need to try that. Can't wait to try this! I'm visiting from Bloggy Moms; stop by and see me at www.pushingonarope.com. Going over to check out your blog now :) Come back again soon! This pasta recipe is a fav around my house. It really is kid friendly, my two boys loved it! It really is isn't it :) I love pumpkin! That looks good, but I'm trying to watch my carbs, so pasta is out. I could never give up carbs, I love them :) I work out everyday so I still stay thin, but eat cookies etc. I have a super sweet tooth!